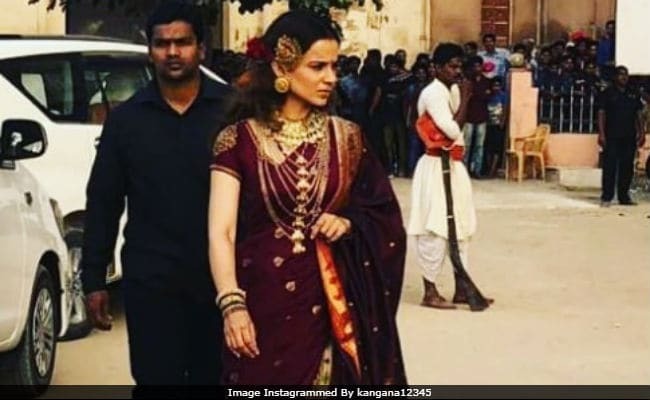 Actress Kangana Ranaut's pictures from Manikarnika: The Queen Of Jhansi sets have been shared widely on social media by her fan clubs. In the pictures which are viral now, Kangana is seen wearing a maroon-coloured heavy sari and golden jewellery. The team is reportedly shooting in Junagarh Fort, Bikaner. Manikarnika: The Queen Of Jhansi is based on Rani Laxmibai and Kangana plays the titular. Last year, a couple of other pictures of Kangana, shooting for the film, went viral and also, a sketch of Kangana as Rani Laxmibai, was shared widely on social media by fan clubs of the actress. See Kangana Ranaut's picture from Manikarnika: The Queen Of Jhansi sets. Here are the other pictures of Kangana and the sketch which went viral. A few days ago, a Rajasthan-based Brahmin outfit demanded that details about Kangana Ranaut's Manikarnika: The Queen Of Jhansi be shared so as to prevent distorting of historical facts. The outfits also threatened to protest and not allow shooting in Rajasthan unless "complete information on the historical ground of the story is made available." Of the whole controversy, she told news agency IANS, "There is nothing controversial in Manikarnika: The Queen of Jhansi. It's really bad on our part to even think about creating such controversies for a woman who gave a tough fight to the British rulers while fighting alone for the country's sake." Later, Kamal Jain, the producer the film gave in writing that the movie will not alter historical facts. Kangana Ranaut suffered two injuries while filming Manikarnika: The Queen Of Jhansi. In November, she injured her ankle while filming an action sequence at the Mehrangarh Fort and in July, she was severely injured during a sword-fighting sequence. Manikarnika, directed by Krish, co-stars Kangana Ranaut with Jisshu Sengupta and Ankita Lokhande. It is expected to release later this year.